Our CEO's Top 10 Books of 2017 | Learn iT! To a certain extent, young children emulate and imitate their parents. -Angela Duckworth, "Grit"
I will hit my goal of 50 nonfiction books in 2017, and I would like to thank my staff at Learn iT! for putting up with my craziness. I hope that they enjoyed the books even half as much as I did. 1. New Sales: Simplified: the Essential Handbook for Prospecting and New Business Developmentby Mike Weinberg I have had the great fortune to have Mike Weinberg work with me and my sales leaders at Learn iT! for the past two years. In my opinion, his approach to generating new business and increasing overall revenue is spot on. “New Sales: Simplified” provides a blunt, easy-to-follow plan for ramping up new business. Mike's humorous approach, great anecdotes, and examples of what salespeople and executives do wrong create a great book for anyone in Business Development. 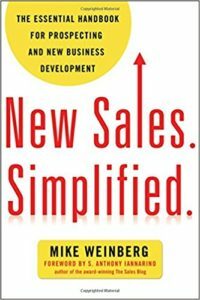 I can honestly say that since reading “New Sales: Simplified” for the first time, I have recommended it in every sales related conversation I have had with friends, business partners, and even competitors in the past 3 years. Hands down, it is a necessary read for anyone involved in sales. 2. Power of Habitby Charles Duhigg This book is a great guide on how to break bad habits and adopt healthier ones. It teaches us about habit loops and a three-step process about how habits work, helping you to create good habits that stick or break bad habits that stink. I love the real-world examples, especially the story about Target and the story about how the song "Hey Ya!" became a hit. Once I started reading “Power of Habit,” I could not put it down! 3. Multipliers: How the Best Leaders Make Everyone Smarterby Liz Wiseman “Multipliers” struck a chord with me from the very first chapter. The book identifies two different types of leaders: multipliers and diminishers. Multipliers encourage growth and creativity while diminishers drain intelligence, energy, and capabilities. Diminishers always need to be the smartest people in a room. I have always striven to create a multipliers culture at Learn iT! that attracts and develops talent, cultivates new ideas from everyone, and gives people a sense of ownership in their work. Although I think I have done a good job overall with my team at Learn iT!, Liz Wiseman's book and its extensive research of 150+ executives helped me realize that I had a couple accidental diminisher behaviors that I needed to work on. Investing the time and energy to understand the five disciplines of genius makers helped me in my quest to become a better leader. As I mentioned, Ms. Wiseman's work struck such a chord with me that we contacted The Wiseman Group and are now one of a select few authorized training partners for Multiplier content. 4. Grit: The Power of Passion and Perseveranceby Angela Duckworth Angela Duckworth's book teaches us that there is more to success than just natural talent. Her research has proven repeatedly that passion and perseverance (hard work) play a significantly more important role in achieving goals than being born with a High IQ. Great business and parenting tips abound in this book, and I absolutely agree with her recommendation to cross-train kids when it comes to sports instead of isolating a child to play one sport throughout their adolescence. It is also important to pick activities and stick with them for more than a year. I could go on and on about how important I believe having grit is. Instead, please take my word for it and read this book. 5. The Score Takes Care of Itselfby Bill Walsh Being able to experience firsthand the San Francisco 49ers dynasty of the 1980s, I believe, contributed to the person I am today. I idolized Joe Montana and still do, not only for his achievements on the field, but for having had the opportunity to get to know him personally. It’s inspiring to see how a superstar of his magnitude could be so humble and kind. I believe that Coach Bill Walsh's influence on Montana and the rest of the 49ers had a similar impact. Reading “The Score Takes Care of Itself” was a walk down memory lane, and it had a tremendous impact on me as a business leader. Coach Walsh's philosophy was to have everyone strive for the same goals, to over-prepare, to treat everyone with respect, and to stress that no one, no matter how talented, was above the team. 6. Man's Search for Meaningby Viktor Frankl Viktor Frankl wrote this book to chronicle his experience in concentration camps during World War II. I cannot do justice and explain to you what Mr. Frankl endured during those years other than to say that his ability to search for meaning in life and his theory of logotherapy had a big impact on me personally. It is easy to see how this book sold over 10 million copies and why the Library of Congress rated it "one of the ten most influential books in the United States." This classic on why people say "yes" and how to apply this understanding is a great read. Dr. Cialdini, Regents Professor of Emeritus of Psychology and Marketing at Arizona State University (my alma mater), takes us through his six key principles of influence with anecdotes, astonishing research, and practical examples. One of the ways I have learned to increase retention from the books I read is through sharing what I have learned with others. In this case, it backfired a little. On a long walk with my wife one night, I told her all about the six key principles of persuasion. Now more than once, she has said to me, "I know what you are doing: you are using what you learned in that influence book to get me to agree to something. I know your tricks!" “Influence” is a great book. I just started reading Dr. Cialdini’s follow-up book, “Pre-Suasion,” and so far, so good! 8. Made to Stick: Why Some Ideas Survive and Others Dieby Chip Heath The Heath Brothers book was one of the most enjoyable and productive books I read in 2017. “Made to Stick” explains and provides guidance on what makes an idea or concept memorable or interesting. The book provides case studies and stories followed up by principles. I have used their six principles to re-write Learn iT! 's core values and incorporate them on a regular basis — even sprinkled throughout this blog. Some of my favorite takeaways are "the Sinatra test" and comparing movie popcorn to a whole day’s worth of unhealthy food in TV commercials. It is a great book on how we can improve the chances of ideas sticking with an audience. 9. 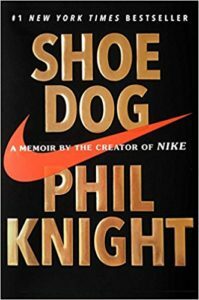 Shoe Dogby Phil Knight Even though “Shoe Dog” came highly recommended by at least a dozen people, I must admit I did not find the idea of reading about a shoe company very intriguing. Then, my brother Taylor said, "Damon, knowing you, once you start it, you won't put it down." Taylor was right. I read it cover to cover in a day and a half. We are all familiar with Nike shoes and Michael Jordan. What I was not aware of was the amazing struggle and perseverance that Phil Knight and his loyal team endured in order to help Nike become the iconic, world-renowned brand it is today. Mr. Knight shares his candid inside story with the reader. Through his trials and tribulations, he overcame doubters and stayed the course. Even when hostile bankers were telling him he was through, Mr. Knight pushed forward with a team that would make any business owner or coach envious. “Shoe Dog” is told in a humble, honest, and inspiring way. 10. Uncontainable: How Passion, Commitment, and Conscious Capitalism Built a Business Where Everyone Thrivesby Kip Tindell Sometime at the beginning of the year, I came across Peter Drucker's quote — "Culture eats strategy for breakfast." This had a profound impact on me. Learn iT! has always had a strong culture, but, as with anything that isn’t given attention, culture can change. I started reading books about companies with great cultures—Zappos, Starbucks, Southwest, Whole Foods, etc. During my studies, I came across the book “Uncontainable,” the story of The Container Store. Kip Tindell describes how he successfully led his company for more than 30 years. His passion is evident as he leads you through The Container Store’s Foundation Principles (i.e., core values) and how they are lived day in and day out by The Container Store team. In my opinion, this is a necessary read for anyone invested in developing a strong company culture. There you have it! Those are my top 10 favorite nonfiction books that I have read in 2017. I would love to get your thoughts or suggestions. You can reach me at Dlembi@learnit.com or connect with me on LinkedIn. Damon Lembi has been the CEO of Learn iT! for 20 of his 22 year tenure. He is an avid sports fan and played first base on the 1994 Arizona State College World Series Team. Outside of Learn iT! you can find Damon hanging out with his dogs Pablo & Charlie, at an 80’s Rock Concert or spending time at home with his wife, Learn iT! Alumni, Cara Mia Lembi.